The Round City of Baghdad was also called Madinat-As-Salam: the City of Peace. 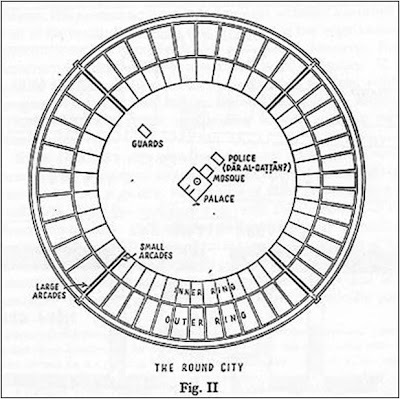 A round city wall was both cheaper to build for a given area and easier to defend. To improve the defenses were bent entrances and the double wall. 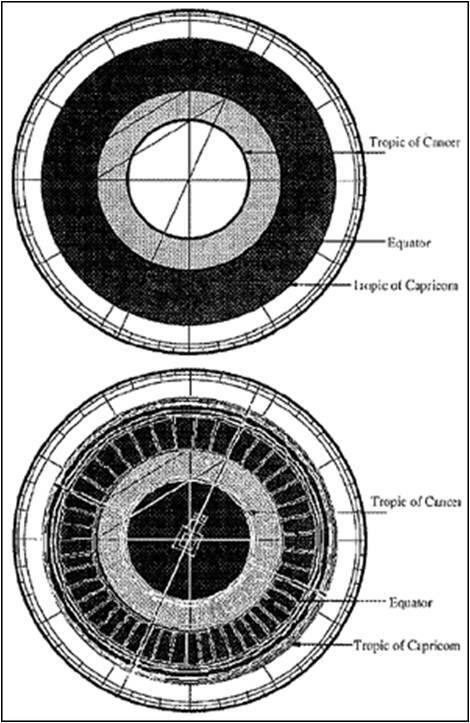 But the circular arrangement of streets and gates was also also tonreflect the orbit of planets,and the central position of the palace and mosque reflects the sun as the center of universe. As it turned out, the history of Baghdad did not turn out to be so peaceful. From 836 to 892 the capital was transferred to Samarra because of troubles with the caliph's Turkish troops in Baghdad. When Caliph al-Mu'tamid moved back to Baghdad he settled on the east bank of the Tigris which has remained the centre of the city to the present day. 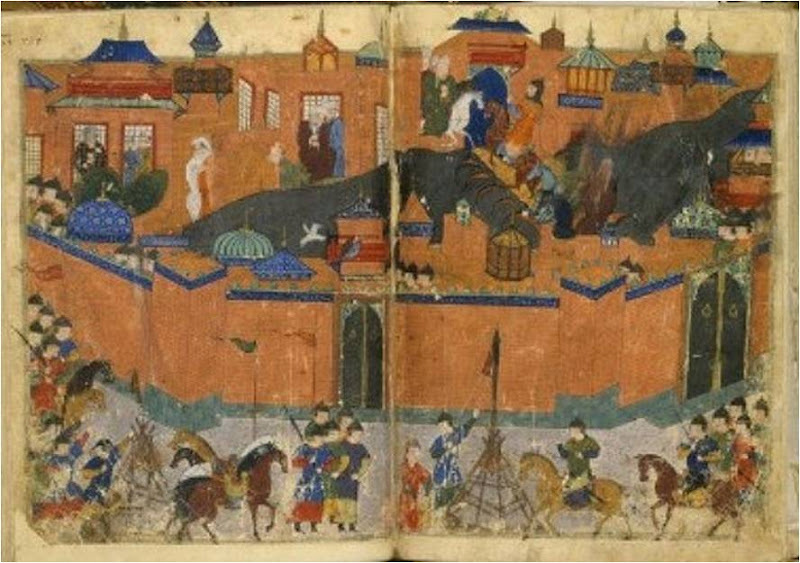 In 1258 Hulagu Khan, a grandson of Genghis Khan captured, sacked, and burned Baghdad. The Grand Library of Baghdad was destroyed. 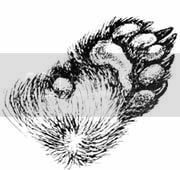 The Tigris ran black with ink from the enormous quantities of books flung into the river. The Mongols looted and then burnt mosques, palaces, libraries, and hospitals to the ground. Estimates of people massacred range from 90,000 to 200,000. Hulagu had to move his camp upwind of the city, due to the stench of decay from the ruined city. The Mongols rolled the caliph up in a rug, and rode their horses over him. The destruction of Baghdad was to some extent a military tactic: it was supposed to convince other cities and rulers to surrender without a fight. But failed in Egypt, which defeated the Mongols at the Battle of Ain Jalut in 1260. When we checked links on our site it was link like sms:?body=Hello%2C%20check%20out%20Windows%20to%20Russia%21%20at%20http%3A%2F%2Fkylekeeton.com%2F what had some sense. Still don't understand what it means and how "blogger.com" uses it... But that's ok - looks like the virus was on server's side. Be honest we had interesting evening investigating all this staff but now we are happy because everything works perfect and we got new article! By the way the link to the image pay for post is from Blogger,com. I have traced that much. This seems to be a server related problem since I can not find it physically in your code (html). I am limited to what I can do from here. I need the blogger code from your dashboard. I really think you have a virus, I seem to be seeing what is called pay for post virus. Scan your system then if nothing report to blogger. go to http://tinyurl.com and you will understand what they have done. I have bothered you enough.